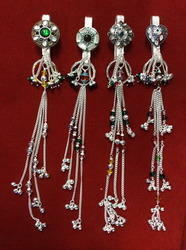 Leading Manufacturer of designer juda pin and silver guchha from Rajkot. We are recognized as the foremost manufacturer and supplier of a classy range of Designer Juda Pin that is crafted using precious quality raw materials. 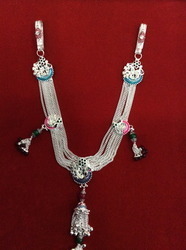 Additionally, our offered jewelry is suitable for both, traditional and modern dresses. This jewelry is available in diverse designs, shapes and finishes as per the specifications provided by the clients. Clients can avail this jewelry from us at affordable prices. Matching up with the ever increasing requirements of the customers, our company is engaged in providing Silver Key Chain.